After months of disagreements and increased bickering among the 28 EU nations, the leaders said they agreed to give Turkey more money to help refugees, swiftly ease visa requirements for Turks and speed up Ankara's accession talks in exchange for its help in stemming migration flows to Europe. French President Francois Hollande said "the summit has created hope that the refugee question can be dealt with through solidarity in Europe, and efficiency in cooperation with Turkey." 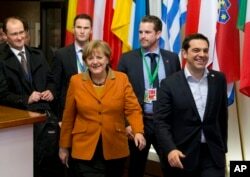 Greek Prime Minister Alexis Tsipras, right, walks with German Chancellor Angela Merkel, center, as they leave an EU summit in Brussels, March 8, 2016. "We hope that we can have an efficient method as well as a results-oriented approach, humanitarian approach without harming any refugee or the rights of refugees," Turkish Prime Minister Ahmet Davutoglu said in advance of the reported agreement at a news conference at NATO headquarters. Davutoglu cast the new Turkish proposals as a way to both rescue lives, staunch migrant trafficking and herald "a new era in EU-Turkish relations." But deep divisions remain over finding a solution to Europe's biggest refugee crisis since World War II. More than 1 million migrants arrived on the continent last year, and roughly 142,000 have arrived so far this year, many crossing the Aegean to EU member Greece from Turkey. FILE - Migrants walk among tents in a muddy field at a camp of makeshift shelters for migrants and asylum-seekers from Iraq, Kurdistan, Iran and Syria, called the Grande Synthe jungle, near Calais, France, Feb. 3, 2016. 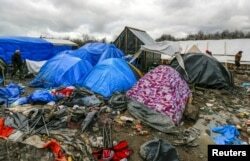 "There is a lack of political willingness to implement the decisions that have been taken," said Sergio Carrera, senior research fellow for the Center for European Policy Studies in Brussels, who said he was baffled by the EU's inaction toward asylum-seekers, many of whom come from conflict-torn countries such as Iraq, Syria or Afghanistan. "This is a European problem, so we have to find collective solutions to this problem," he said. "These include basic human rights of the people arriving,” he said. “Then they want to rewrite their rules according to their own wishes." But, he added, "a union cannot function like this." Ahead of the Brussels meeting, Human Rights Watch warned that a potential deal with Ankara would mean a "flawed and potentially dangerous policy to refugee flows" across the Aegean. "EU leaders are in a panic to stop refugee flows before spring," senior Human Rights Watch official Judith Sunderland said, "and they seem willing to throw human rights overboard in the process.